Kevin Sharp is a New Mexico native who currently lives in Northern California, where he teaches high school English. 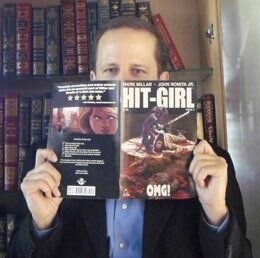 He is the author of numerous screenplays and two award-winning short stories. While he has technically grown up, Kevin has yet to outgrow Looney Tunes, "The Price is Right", fantasy novels, or comic books. Deep down, he still thinks that working with apes would be the best job in the world. There wasn’t one defining moment – more like a series of them. I devoured everything I could get my hands on as a kid: Tolkien, C.S. Lewis, Ray Bradbury, Piers Anthony, Stephen King, comic books. In fourth grade I wrote a terrible Star Wars stage play, which my friends and I performed for our class. In high school I wrote a fantasy trilogy (which I recently found & am afraid to read). After college I got into screenwriting, and now here we are. Favorite YA: Before I Die by Jenny Downham. It’s about a girl with terminal cancer – which sounds like a downer to read, I know – but the voice is so real and powerful. The final pages are unforgettably brilliant. Favorite non-YA: The Last Samurai by Helen Dewitt; The Ice Storm by Rick Moody; A Sport and a Pastime by James Salter; Nine Stories by J.D. Salinger. I will also add the fantastic graphic novel Blankets by Craig Thompson. The work is so powerful it brought tears to my eyes through simple black & white drawings. Finish everything you start. Even if the ending is terrible, put one on and make it better later. 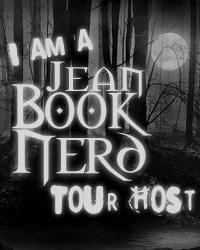 In your book; After Dakota, can you tell my Book Nerd community a little about it? It’s a year in the life of three teenagers – Cameron, Bryce, and Claire – in 1983. At the beginning of the story (no spoiler), they find out that their friend, Dakota, has been killed in a plane crash. The story is about how they each process this information, while at the same time dealing with high school and planning for their futures. This book was written as a tribute to the classic teen movies of the 1980s, like Fast Times At Ridgemont High, The Breakfast Club, and Say Anything (and so many more). That was one thing that made the novel a tough sell; I was told by agent after agent that modern teenagers aren’t interested in those kinds of stories, that they “only” want science fiction and supernatural stories. When I think back on how much those movies mattered to people of my generation, I just can’t believe there’s no place for them anymore. For those who are unfamiliar with Cameron, how would you introduce him? Cameron is high school senior with a 4.0 GPA and a bright future. He’s realizing, though, that this life path laid out in front of him may not be what he wants after all – and he’s wondering what he can do about it. I’m currently working on a YA science fiction novel. I’ve always loved sci-fi but I’ve had very little experience writing it, so this is a fun challenge. After that I have an adult novel percolating that’s set in the movie business. What part of Bryce did you enjoy writing the most? His unapologetic belief in himself. Yes, he’s a geek. Yes, he’s a stalker. But it all comes from a place of sincerity. I have mad love for Bryce, which is why I put him through teenage hell. What was the most surprising thing you learned in creating Claire? Claire is an example of a character telling the writer what she’s going to do. She started out as a much more shy girl, who would do all she could to avoid confrontation or standing out in any way. Then she told me she was done being that person. Almost all of my neighbors growing up were girls, so I really enjoyed living through Claire’s eyes over the course of the novel. “What is your all-time favorite book/movie?” It’s because the answer can literally change day to day, so the truth today might be a lie tomorrow. Every writer has to go through this process, like a snake shedding its skin. We all start out trying to sound like the writers we love. I can look back at my old work and see exactly who I was reading at those times. The more you write, the more you’ll eventually move away from that habit and start to sound like yourself. It was longer than a summer, but I did work at Chuck E. Cheese (like Cameron does in the book). Not only was it memorable, it also scarred me – I’ve never set foot inside one of their restaurants ever since. On the flip side, I worked at a comic book store, which was the best job of all time. I would go back to that job in two seconds if I could. In third grade, a British girl named Rosemary had a huge crush on me. The feelings weren’t returned, but she cornered me one day and delivered my first kiss. The character Rosemary in the novel is a shout-out to someone I’ve never forgotten. Definitely the second one. If you tell someone you love them & they don’t return the feeling, what have you really lost (other than maybe a little dignity)? Saying the other one means you’re putting a knife in someone’s heart. But still, better to do that than lead them on. Watching the movie Star Trek II: The Wrath of Khan. Wow, this is hard. If I choose the 1950s I can be around for Elvis Presley, James Dean, Marilyn Monroe, Catcher in the Rye, and the birth of rock & roll. If I choose the 1960s I get the Beatles, the space race, The Graduate, 2001: A Space Odyssey, and all the great psychedelic rock. Flip a coin. I hate to give a cheesy answer, but here it is: LIFE. None of my major life events have been planned – I would’ve never been so delusional! The high school version of me had no idea what he would do. The college version thought he was going to be an actor. The post-college version of me sat in a cubicle while a powerful Hollywood agent told me my first screenplay was “brilliant” and that I should make career plans to move to L.A. Now I teach high school writers every day – even though I’m the teacher, I learn as much from them as they do from me. An 84-year-old cancer patient recently emailed me to say that reading After Dakota had been a bright spot in his recent life (and he’s not even the audience for it!). How could I have possibly planned an adventure this crazy?? 1983. Newborn MTV. Cabbage Patch Kids. President Reagan. A U.S.-U.S.S.R. Cold War that threatens to go hot at any moment. Against this backdrop, three teens begin a year of change and turmoil following the sudden loss of one of their closest friends. Dakota meant different things to Cameron, Bryce, and Claire. When she disappears in a plane crash, they each have to face their own mortality, along with the secrets they still carry about her. Cameron Casey’s goal for senior year of high school is to maintain his 4.0 GPA so he can escape to his dream college. Then he meets a new girl, who he comes to see as his second chance with the recently departed, a second chance he’s determined not to waste. Bryce Rollins, Cameron’s best friend and fellow senior, has big dreams that include being a professional artist and not going through high school dateless. When he becomes convinced he has a terminal illness, he realizes these both may be hopeless causes, the kind he does best. Kevin Sharp’s After Dakota is an incredible story about three teenagers living in the 80’s and their transformations after losing Dakota, who had significant meanings for each of them. As a senior in high school, Cameron tries to stay focus and maintain his 4.0 grade so he can go to his dream college. After losing Dakota, he feels he has been given a second chance when he meets a new girl. Fellow senior and best friend Bryce has been stricken with a terminal illness and his dreams of becoming a professional artist and going through his final year in high school dateless will have to become secondary’s. As a freshman, Bryce’s sister Claire will have to face the fact that she’ll be on her own. She finds friendship and guidance from a boy that tests her principles and even God. They never though that life after Dakota would have a power impact in their lives. Although Cameron, Bryce, and Claire we so different towards their life goals, there were parts of their stories that anyone can relate to. I can certainly say that I enjoy a book more if I can relate to the character, but Mr. Sharp manages to give us three that we can share moments with. Their life-after-Dakota journey was nicely developed and interestingly different from one another. The 80’s setting will bring lots of nostalgic moments for readers who were blessed enough to experience a decade where life was simpler and less stressful, especially if they were a teenager. The countless references of this decade, whether a TV show, movie or song, it gave authenticity and provided great reminiscence. 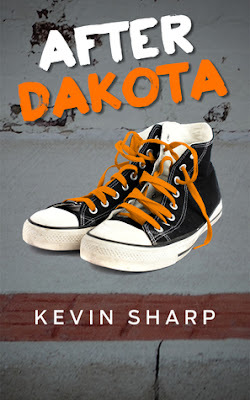 Kevin Sharp’s After Dakota is an accurate capture of three teenage protagonists who try to deal with life after the traumatic loss of one of their best friends. The focus on teenage life should not be a deterrent for adult readers as it provides a channel for them to reflect on their own teenage upbringing. With a story that is delicate in certain issues, Mr. Sharp manages to deliver a unique and clever story that is full of details that will make you analyze your own life and how differently it would be with the absence of someone dearly close. Thank you Kevin for making this giveaway possible. 1 Winner will receive a Signed Copy of After Dakota by Kevin Sharp. 1 Winner will receive an E-Copy of After Dakota by Kevin Sharp. Pft. The 20's for me. Jazz, speak-easies, and gangsters? Sign me up! I would still choose the same decade that I was a teenager which was the 90's. I LOVED everything about the 90's. The music, clothes and so much more. Thank you so much for this awesome giveaway!! The 60's. A time of great change and revolution. The 20s! I am a HUGE fan of the Roaring 20s! The parties, the fashion, the feeling of relief due to the end of the war. And I could go on! Thanks for the giveaway Jean!